Posts tagged The Daring Adventures of Bob and Houde! 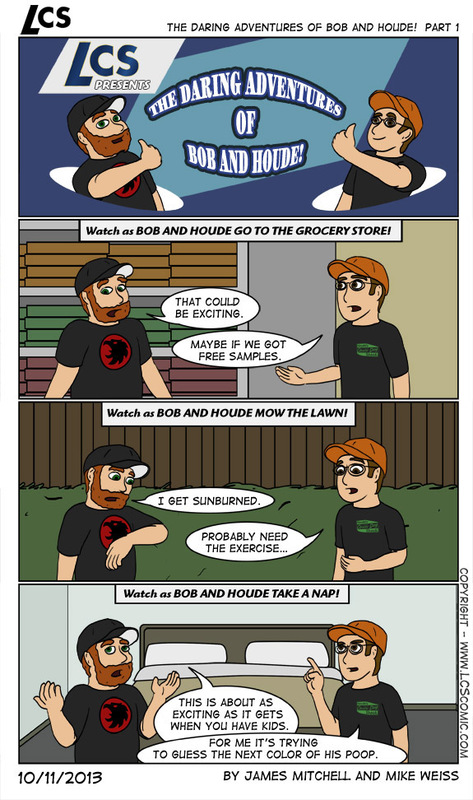 Mike: Introducing the premiere page for The Daring Adventures of Bob and Houde! A new filler series written by Nathan. See every so often James forgets to write a script which leaves me in a bind. So we’ve asked our buddy Nathan to write a bunch of filler scripts that can be pulled out whenever needed. Nathan: If anyone is reading this, HELP ME! I’m locked in Mike’s basement! Fantasy vs Reality filler holiday Neil: Secret Agent The Daring Adventures of Bob and Houde!